SE ENVIA EL MISMO DE LA FOTO. DISPONEMOS DE UN GRAN SURTIDO DE RECAMBIOS DE VEHICULOS ANTIGUOS. This kit will suit both 7in and 7.5in type diffs including Sierra Cosworth LSD. Use your kit to reseal your diff and help stop oil any oil leaks. 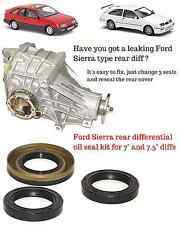 FORD SIERRA DIFF OIL SEAL KIT. 2 x Driveshaft oil seals. The product featured is a overhaul rebuild and repair kit for the Ford Capri Atlas Salisbury Axle Differential. Based on the Ford Capri Atlas Salisbury Axle this item fits the following car manufacturer and models: FORD - CAPRI MK1 (1969-1974), MK2 (1974-1977), MK3 (1977-1986). FORD TAUNUS '80 (GBS, GBNS) 1.3. FORD TAUNUS '80 (GBS, GBNS) 1.6. FORD TAUNUS '80 (GBS, GBNS) 2.0. FORD TAUNUS '80 (GBS, GBNS) 2.3. FORD TAUNUS (GBTK) 1300. FORD TAUNUS (GBTK) 1600. FORD TAUNUS Turnier (GBNS) 1.3. FORD FIESTA I (GFBT) 0.9. FORD FIESTA I (GFBT) 1.1. FORD FIESTA Furgón (WFVT) 1.0 (WFVT). FORD FIESTA Furgón (WFVT) 1.1 (WFVT). DISPONEMOS DE UN GRAN SURTIDO DE RECAMBIOS DE VEHICULOS ANTIGUOS. POR SER ARTICULOS MUY ANTIGUOS CARECEN DE GARANTIA DE FABRICACION, YA QUE NO SE FABRICAN EN LA ACTUALIDAD, O LOS FABRICANTES HAN DESAPARECIDO. Fits between the axle back plate and the axle case to stop oil leaks. Standard thickness but made from modern high temperature gasket material. Bearings, seals and gaskets supplied are always of a high quality, many, including Timken and SKF would have been OE as supplied to the vehicle manufacturer. FORD ZEPHYR CONSUL ZODIAC MK2 & MK3 DIFF PINION OIL SEAL. New differential pinion seal for Ford Zodiac, Zephyr and Consul. Código interno: 1052038. Diferencial delantero FORD EXPLORER 4.0 V6, Año: 1999 1618. Referencia : 47446, Observaciones: Cardan 4 tornillos. Wir können es überprüfen. Nous pouvons le vérifier. Fit a new gasket to stop the leaks between the main diff case and the axle case. FORD ENGLISH AXLE DIFF PINION OIL SEAL & HEAVY DUTY GASKET. 1 x Heavy Duty Diff gasket. 1 x Pinion oil seal. MADE USING MORE MODERN GASKET MATERIAL THAN STANDARD GASKET. DIFERENCIAL TRASERO FORD FORD SCORPIO BERL. /TURNIER 2.3 16V DOHC CAT 0.95 - 0.9 año 1995 Y5B WF0NXXGAGNV Código interno:3086873. Delfin card. Nós podemos verificar isso. Wir können es überprüfen. The item contents consist of 1x Pinion Oil Seal and 1x Differential Gasket. FORD - CAPRI MK1 (1969-1974), MK2 (1974-1977), MK3 (1977-1986). This applies to countries which are located in'remote location areas'. As fitted to Sierra/Scorpio 7" & 7.5" rear diff units. NEW PAIR OF DIFFERENTIAL ADJUSTING SCREW "O" RINGS FOR FORD SIERRA & SCORPIO REAR DIFFERENTIALS. Fit on the outside circumference of the side screws to stop oil leaks. FORD ZEPHYR CONSUL ZODIAC MK2 & MK3 DIFF PINION OIL SEAL & GASKET SET. New differential gasket & pinion seal for Ford Zodiac, Zephyr and Consul. 1 x Pinion oil seal. Will fit the 'English' and 'Atlas' type axles. HIGH TENSILE 10.9 GRADE PROP SHAFT TO DIFF DRIVE FLANGE BOLTS & SPRING WASHERS. Bolts and washers are high tensile 10.9 grade steel, with a bright zinc finish. The item contents consist of 2x Ford Capri Atlas Salisbury Axle Differential Wheel Bearing (61mm). Based on the Ford Capri Atlas Salisbury Axle this item fits the following car manufacturer and models: FORD - CAPRI MK1 (1969-1974), MK2 (1974-1977), MK3 (1977-1986). Código interno: 647818. Diferencial delantero FORD KUGA Trend, Año: 2010. Wir können es überprüfen. Nous pouvons le vérifier. 9V4N4A319AA ( #9V4N-4A319-AA ) 1673828. 9V4N4A319AA oil filter for Ford Kuga AWD. Ford Kuga 2008.12-2012. The Volvo fluid is 1 litre and £28.11 Volvo Part Number 31367940. 8V414A319AA oil filter for Ford Kuga AWD Generation 3 Haldex System. 8V41-4A319-AA ( #8V414A319AA ). Ford Kuga 2008.12-2012. The Volvo fluid is 1 litre and £28.11 Volvo Part Number 31367940. 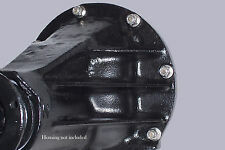 NEW CATERHAM SEVEN STYLE REAR ALLOY BACK COVER FOR FORD SIERRA & SCORPIO REAR DIFFERENTIALS. Only suitable for Caterham 7, Kit Cars and other cars using the Sierra type diff that do not require the rear rubber mounting that would normally bolt to the back cover on the standard Ford Sierra. HIGH TENSILE (10.9 GRADE) PROP SHAFT TO DIFF DRIVE FLANGE BOLTS & SPRING WASHERS. Images of diff and flanges shown for example only, and not included in this sale. 4 x Ford differential drive flange bolts & spring washers ,high tensile, zin c plated. Based on the Ford Sierra Cosworth 4x4 Front Axle this item fits the following car manufacturer and models: FORD - SIERRA XR4x4 2.8 (1985-1988) / SIERRA RS COSWORTH (1986-1988). The item contents consist of 1x Pinion Oil Seal and 1x Output Seal. Código interno: 219107. Diferencial trasero FORD SIERRA TURNIER, Año: 1992 84500, Observaciones: [v.a.] ford sierra fastback (gbc, gbg) 2.0 16v cosworth 4x4 01.90 - 02.93 [ref.ant] 1992 a.ant. grupo diferencial tra. Código interno: 185296. Diferencial delantero FORD GALAXY 1.9 TDI, Año: 2001. Wir können es überprüfen. Nous pouvons le vérifier. FORD ENGLISH AXLE DIFF PINION OIL SEAL. New pair of oil seals to suit Ford Anglia 105E axles with the Ford English diff fitted. These oil seals fit in the end of the english axle tubing to retain the oil in the axle. Bearings, seals and gaskets supplied are always of a high quality, many, including Timken and SKF would have been OE as supplied to the vehicle manufacturer. Based on the Ford Sierra Cosworth Rear 7"/7.5" Axle this item fits the following car manufacturer and models: FORD - SIERRA XR4x4 2.8 (1985-1988) / SIERRA RS COSWORTH (1986-1988) OTHER SIERRA DIFFERENTIAL MODELS. Based on the Ford Capri Atlas Salisbury Axle this item fits the following car manufacturer and models: FORD - CAPRI MK1 (1969-1974), MK2 (1974-1977), MK3 (1977-1986). This applies to countries which are located in'remote location areas'. This is the crush spacer that fits between the pinion bearings to set the bearing preload. Kit includes: 1 x Pinion preload spacer. Código interno: 127806. Diferencial delantero FORD MAVERICK 2.7 Turbodiesel, Año: 1993 38511623007, Observaciones: [v.a.] ford maverick (uds, uns) 2.7 td 02.93 - 08.96. [ref.ant] 5519 relacion 37-8. These shims fit between the differential and diff carrier bearings to adjust backlash. SET OF 10 NEW BACKLASH ADJUSTING SHIMS FOR FORD "ATLAS" TYPE AXLES. Genuine Ford Kuga 2008-2012 4WD Differential Seal - 1509853. This is brand new but it is part of a multi pack so when sold it will be sent in non original packaging. Please take a look at my other items. Thanks for looking. Item Part Number: FRDENGLISHSPA. This applies to countries which are located in'remote location areas'. This applies to countries which are located in'remote location areas'. FORD MUSTANG Conjunto diferencial. Pieza Conjunto diferencial. Año: 05 06 07 08 09 10 11 12 13 14.  Pieza defectuosa. Ninguna devolución será aceptada sin previa autorización, excepto. Año: 06 07 08 09 10 11 12 13 14. Pieza Árbol de Transmisión Del.  Pieza defectuosa.  Pieza equivocada. NOTA: SE DENOMINAN GASTOS DE DEVOLUCION A LOS OCASIONADOS POR EL TRANSPORTE.  Mientras no las recibamos, las piezas siguen siendo de su propiedad. HEAVY DUTY FORD ENGLISH AXLE DIFF GASKET. Fit a new gasket to stop the leaks between the main diff case and the axle case. Anglias and Lotus cars. WILL NOT TEAR OR BREAK AS EASILY AS STANDARD FORD SIZE. Fit a new gasket to stop the leaks between the main diff case and the axle case. FORD ENGLISH AXLE DIFF PINION OIL SEAL & HEAVY DUTY GASKET. 1 x Heavy Duty Diff gasket. MADE USING MORE MODERN GASKET MATERIAL THAN STANDARD GASKET. FORD ATLAS AXLE PINION BEARING PRELOAD CRUSH SPACER. Fits between the two pinion bearings and when crushed will set bearing preload. The item contents consist of 10x Ford Capri Atlas Salisbury Axle Differential Gasket. Based on the Ford Capri Atlas Salisbury Axle this item fits the following car manufacturer and models: FORD - CAPRI MK1 (1969-1974), MK2 (1974-1977), MK3 (1977-1986).